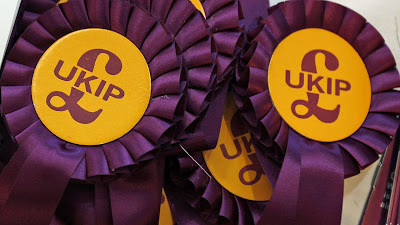 Mythological Ponderings: UKIP elect their new leader this week, but does it matter anymore? UKIP elect their new leader this week, but does it matter anymore? This article originally appeared on United Politics on 12/09/2016. This Thursday sees the election of the new UKIP leader. Arguably one of the more difficult jobs in politics, considering the admiration Farage receives from the party faithful. Whoever takes the role will have big shoes to fill. Replacing Farage will not be a simple task, especially in light of all the controversy that has surrounded this leadership election. The two candidates most favoured for the job aren’t on the ballot paper. Suzanne Evans, who was suspended by Farage back in March for ‘disloyalty’, and Steven Woolfe, who many saw as the obvious successor, was controversially kept off the ballot by UKIP’s NEC. This act has caused huge consternation amongst UKIP members and supporters. A mixed race, northern working class boy done good with a charismatic presence and professional media style, he was seen by the membership as the ideal candidate to take the party forward to fight Labour in those northern working class constituencies it has long taken for granted, and avoid a slide into irrelevancy in the wake of the referendum vote. That was how Woolfe positioned himself too. At his leadership rally in Manchester – a few days before the application deadline closed, he spoke of the need to professionalise and detoxify the party. This is an issue recognised by much of the membership too. All parties have their lunatic fringes, but UKIP are not the swivel eyed loons many make them out to be, just working class people who feel abandoned by the two main parties. But after Woolfe failed to get his application papers in before the deadline, blaming technical failings of UKIP’s submission system, the NEC ruled that he was ineligible to stand. This has caused uproar within the membership. Branches across the country have been holding votes on whether or not to call for an EGM to discuss constitutional reform – one imagines code for ‘abolish the NEC’ in light of the decision. Their dismay has been further confounded by reports that Lisa Duffy, a UKIP councillor standing for leader, had her application bankrolled by an NEC member who failed to declare a conflict of interest prior to the Woolfe vote, and news that the Gambling Commission was investigating a large bet placed against Woolfe becoming leader, before the NEC result was known. This internal warfare means that UKIP have gone from being perfectly placed to capitalise on the Brexit vote and professionalise their image in the post-Farage era, to disappearing into the irrelevancy some predicted would befall them in the event of a Leave vote. Woolfe garnered a lot of media coverage for his fledgling bid, but the contest has been all but ignored by the mainstream media since his exclusion. The current favourite Diane James does possesses the same media polish that Woolfe has, but being a southerner, will struggle much more to connect with those working class communities up north. This will prevent a steeper uphill climb for UKIP to increase their vote share and really take the fight to a Labour party in equal disarray. With a less than optimal new leader, and a membership divided and railing against the party machine, UKIP run the risk not of unseating Labour, but following their lead to electoral irrelevance. The ship Farage steered to a win at the European elections, over 4 million votes at the general election, and ultimately to their finest hour of the referendum win, risks hitting the rocks just as it picks up steam. We will soon find out whether or not the new skipper can successfully steer them to a new course, or whether they will sink to the bottom of the ocean of British politics.